Multi-Vendor Marketplace app for Shopify is a great tool to convert your shop into a fully functioning marketplace. 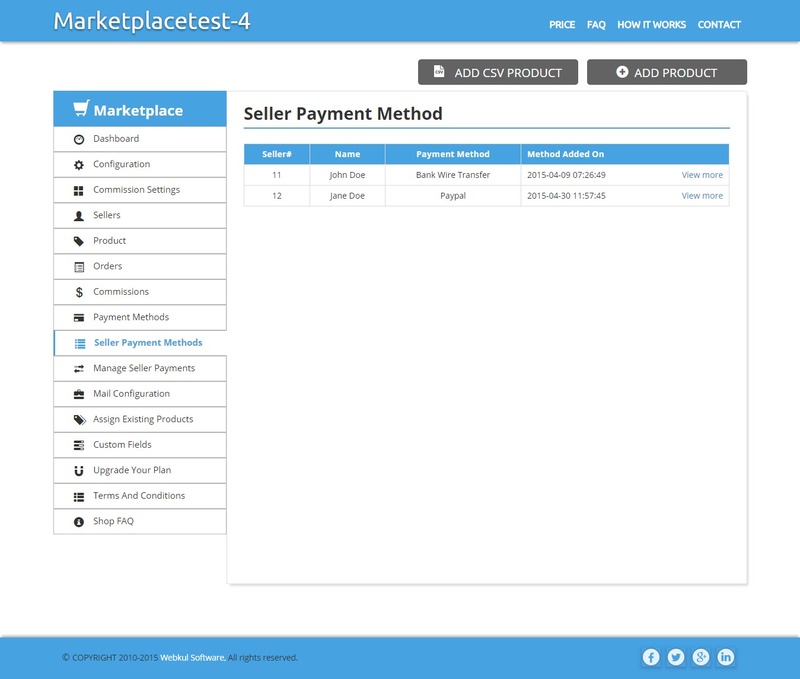 It facilitates the process of adding sellers and keep track of their sales. 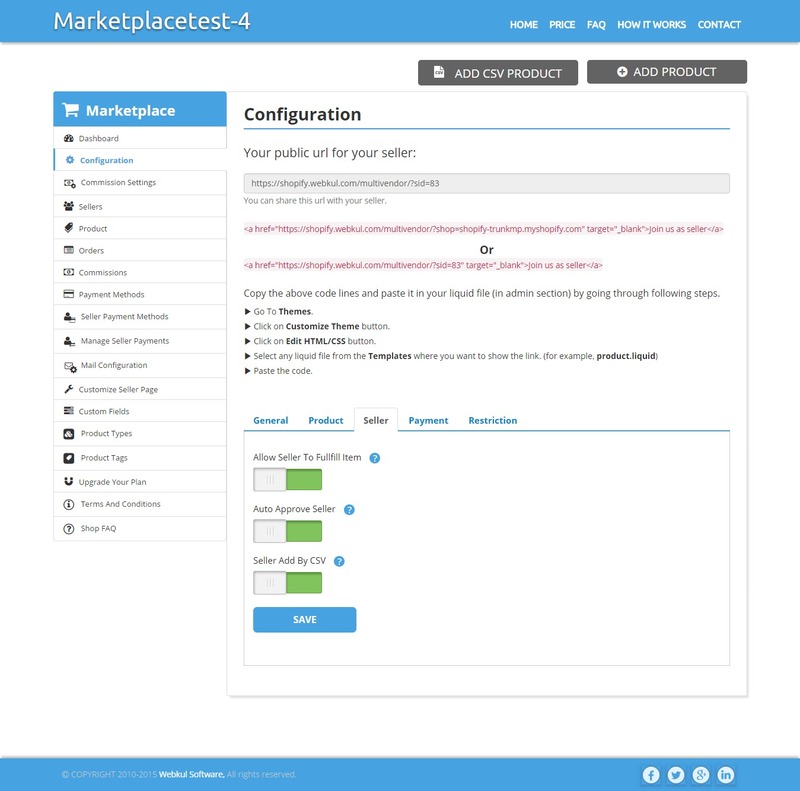 Sellers can create their own shop with a variety of products. Admin can easily set individual commission and global commission for all the sellers. Admin can add new sellers through CSV file. No security or access right issue, as only admin can log in from the backend. Import the existing products to his shop. Admin can choose the shop type. In this, once the order is placed by the customer, the Admin can send a reminder to the vendor by clicking on the Reminder button in front of the fulfillment status,& an automatic mail will be sent to the vendor for fulfillment of the order. Admin can pay the vendors through PayPal payment gateway. It is mandatory for both Admin & Seller to have Business Paypal Account. Admin can allow/disallow seller to delete & to add the Product. Easily upgrade or downgrade the plan. 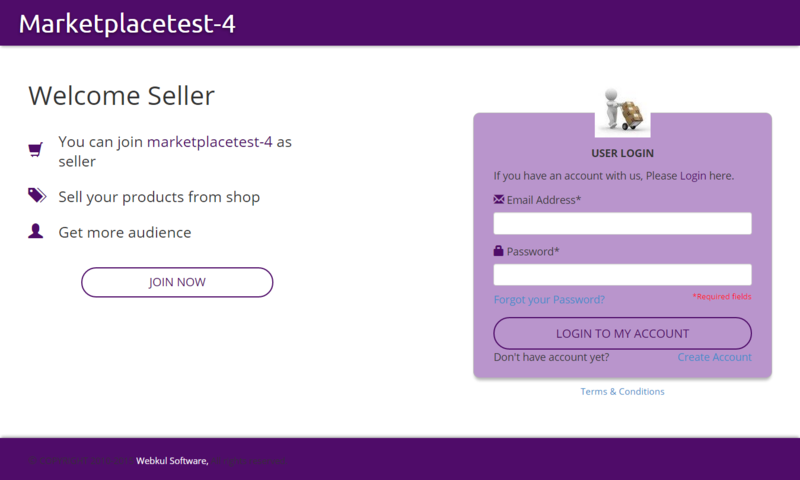 Customer/Buyer can rate the seller,& those ratings will be visible on the store and seller profile page(back end). Admin can view the seller profile page of each seller by clicking on view button of action column on from List of sellers page. 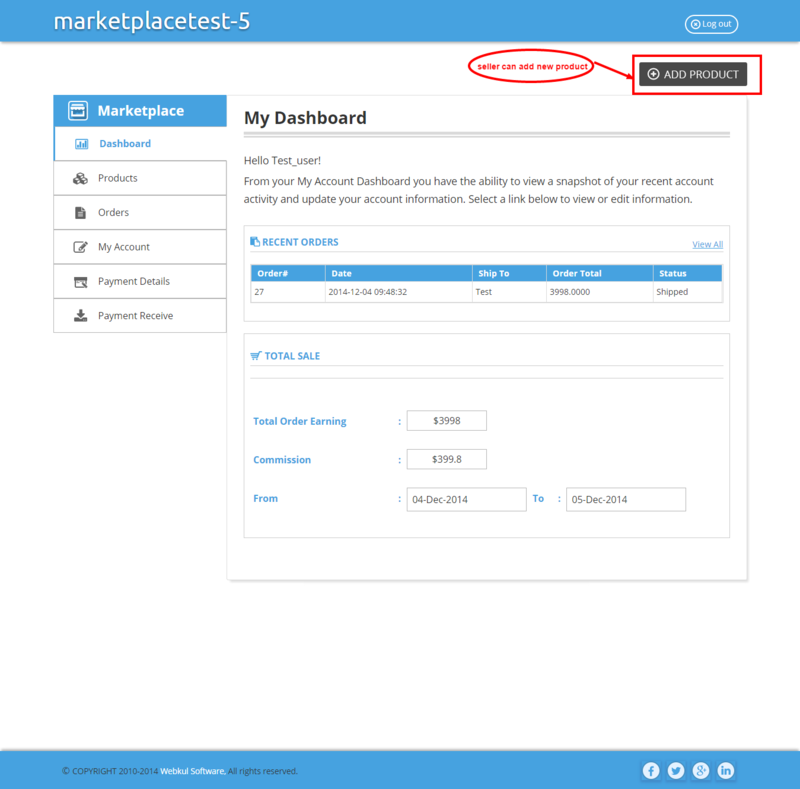 The seller can view his own details as User information in “My Account” section after logging in. Multivendor App is now Multilingual with Weglot Translation. Much more informative dashboard showing Total Seller, Recent Orders and their fulfillment status and details of Total sales. 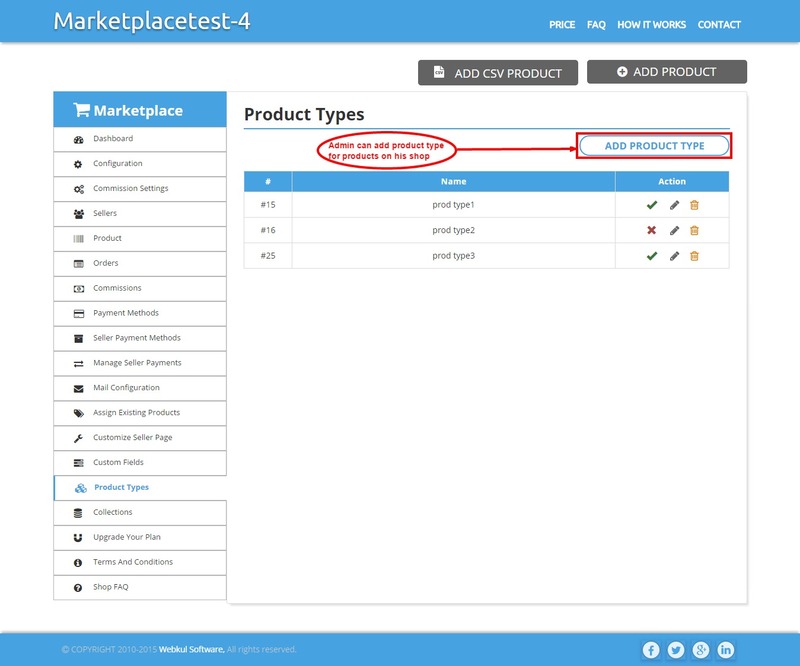 Now the product can be enabled or disabled from the product listing itself. and the filters to search the products is also introduced. 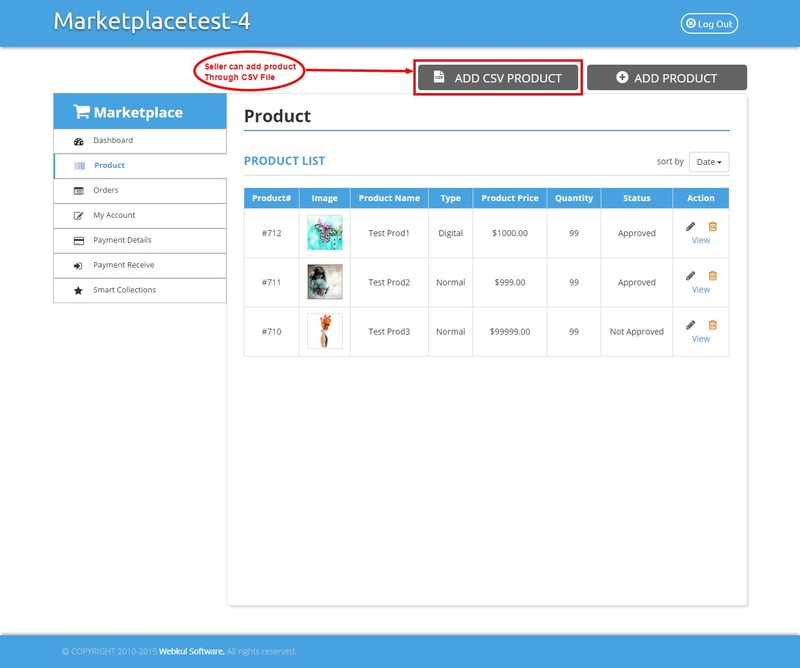 An extremely amazing feature of Multivendor marketplace is “Reminder Feature” to remind the vendor for order fulfillment. The payfast payment gateway is newly introduced as a payment mode. How to Install Multivendor Marketplace app for Shopify? 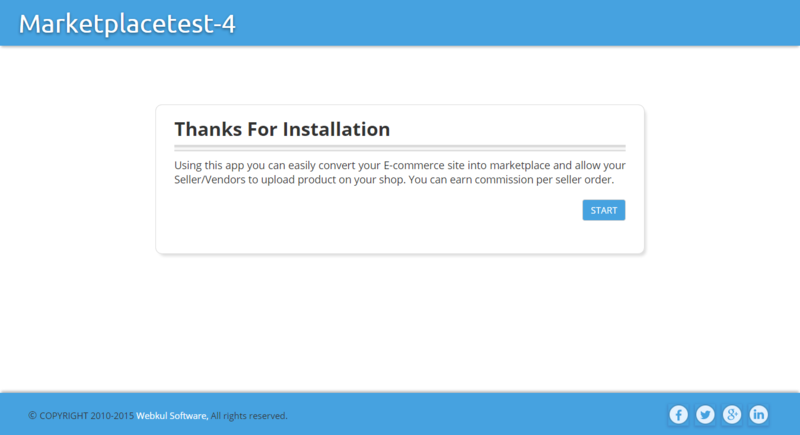 2: After clicking on the INSTALL button, it will redirect on your shop. 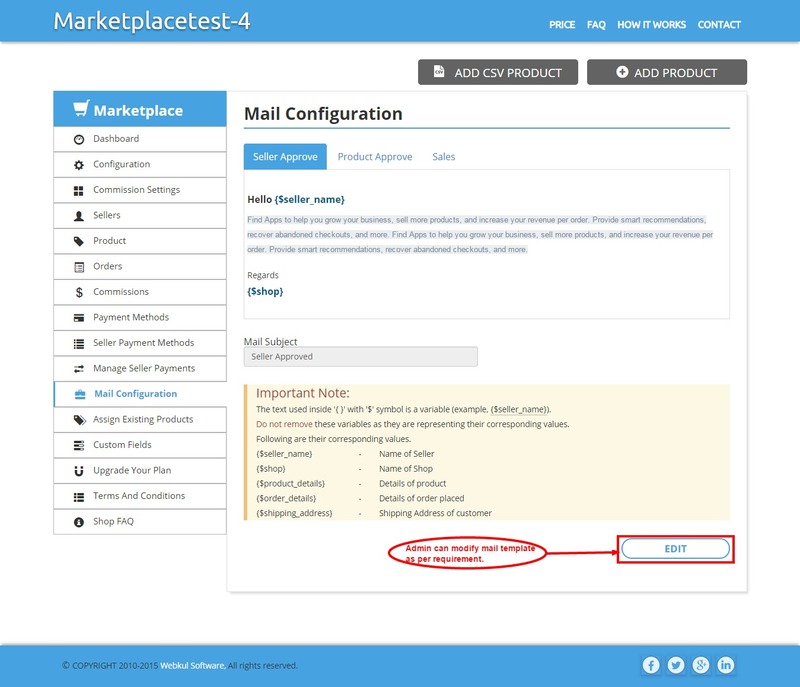 From here you can install “Multi-Vendor Marketplace”. 3: Now you have to choose any 1 of the plan as per your requirement. Each plan has its own benefits & specifications. 5: Here you need to enter your email id. 6: Now you have to set commission. This would be a global commission. You can modify it later from configuration & you can also add commission for individual seller & for the product as well. 7: Click on LET’S GO button & you are all set to experience your own MARKETPLACE with numerous sellers & innumerable products. It provides complete details of total orders & sale on your shop. Admin can know about the total sales between any two specific dates, just pick a date from date picker & admin will know about total order earnings & commission for that particular time. From here Admin can do basic settings for his shop. 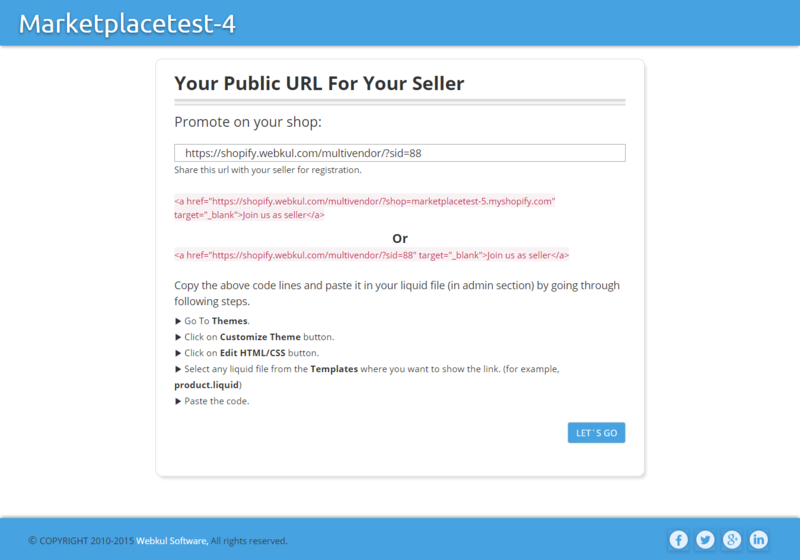 Just copy the above code in any of the liquid files of Templates where you want to show the link for creating a seller account. * Note: In the above code, “your shop name” would be the name of your shop. Here “multishop.com” is the shop name. 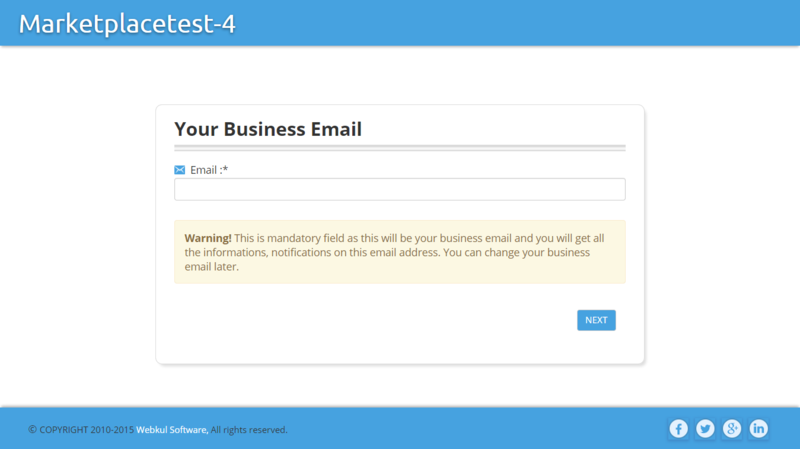 Business Email: As it is a mandatory field so you have to provide your business email id & you will get all the notifications of your shop. Domain Name: This would be your shop domain. 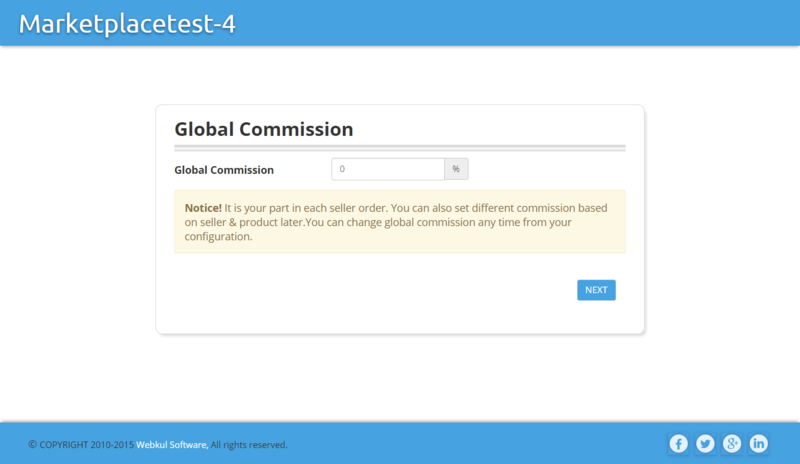 Global Commission: Admin can set global commission for seller. Currency & Language: From here admin can set currency & language for his shop. Weight Unit: Admin can also choose weight unit for the products. Shop Type: From here, admin can choose the kind of shop that he wants. >> Normal: It will include only simple products. >> Digital: It will include only downloadable products. Your Shop Logo: It allows admin to add shop logo to their shop. 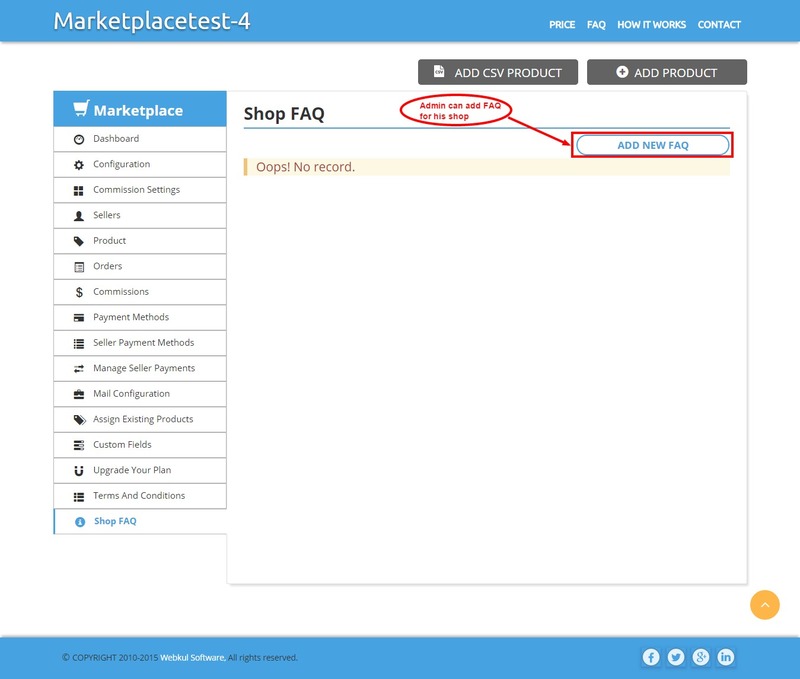 Shop FAQ: From here admin can set whether to show shop FAQ to the seller or not. 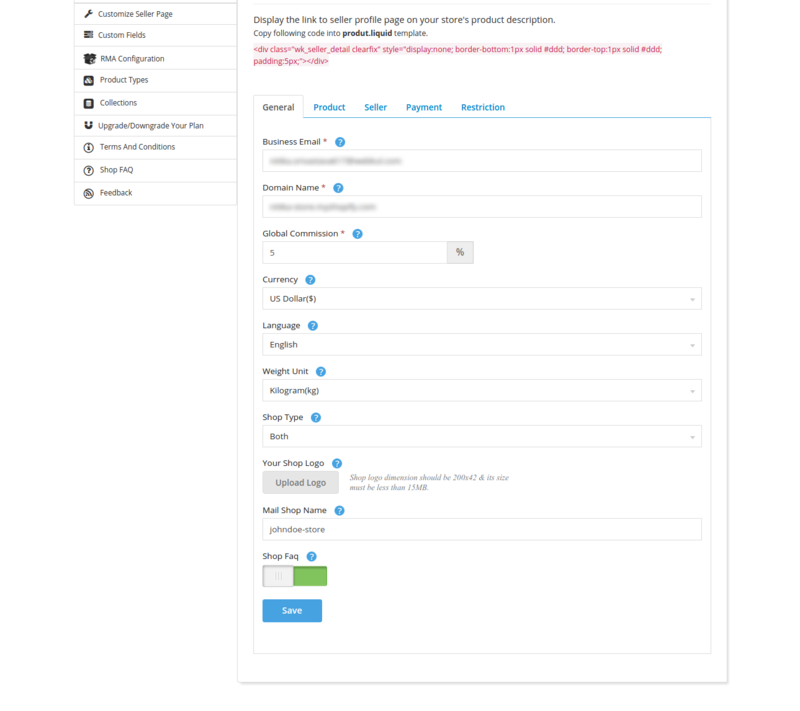 Auto Approve Product: Here admin can set the option for whether you want to approve seller product automatically or not. 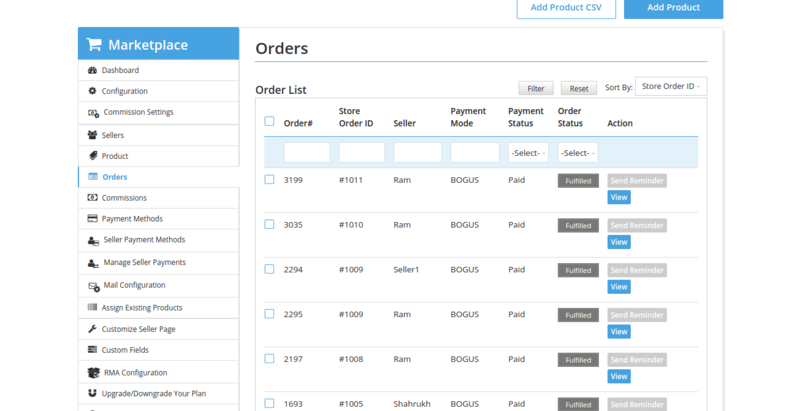 Product Add By CSV: Here admin can enable whether to add Product through CSV or not. 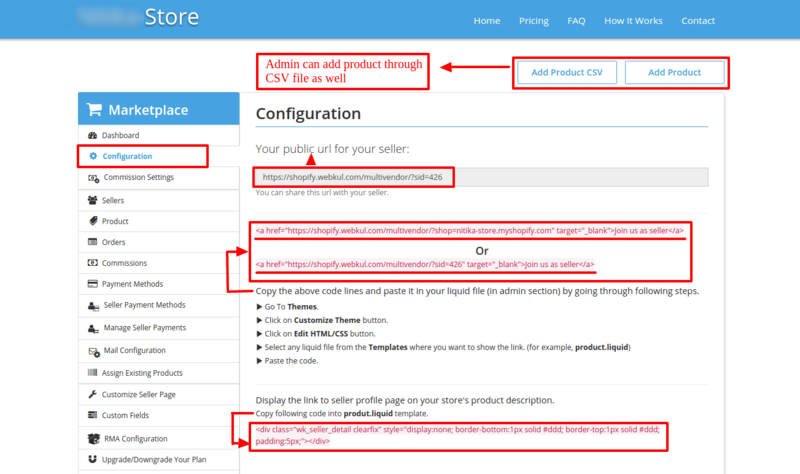 Instructions & Sample CSV file has been mentioned on the add product page. 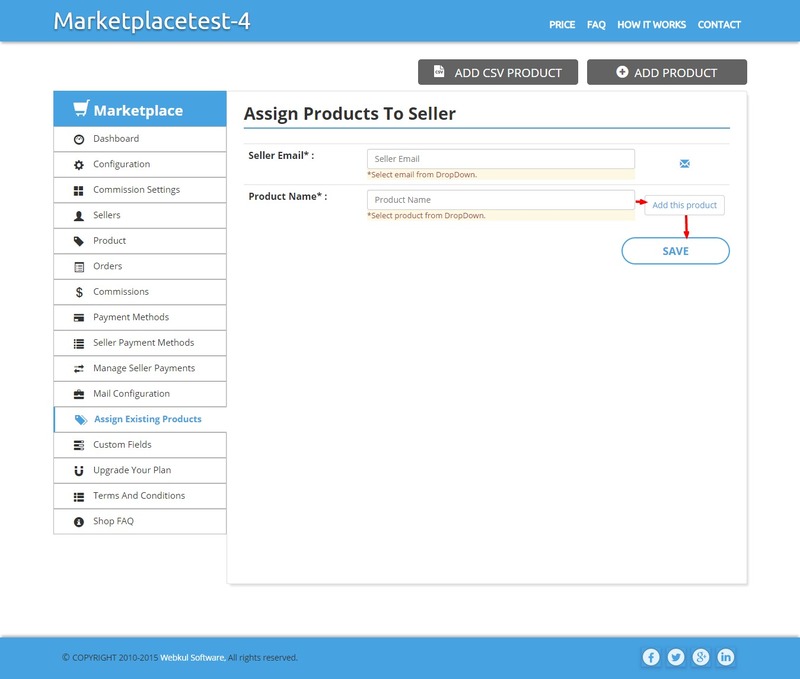 Allow Seller To Add Product: From here admin can enable whether he allows the seller to add their products or not. Import Existing Product: Admin can set the option of whether to import existing products or not. 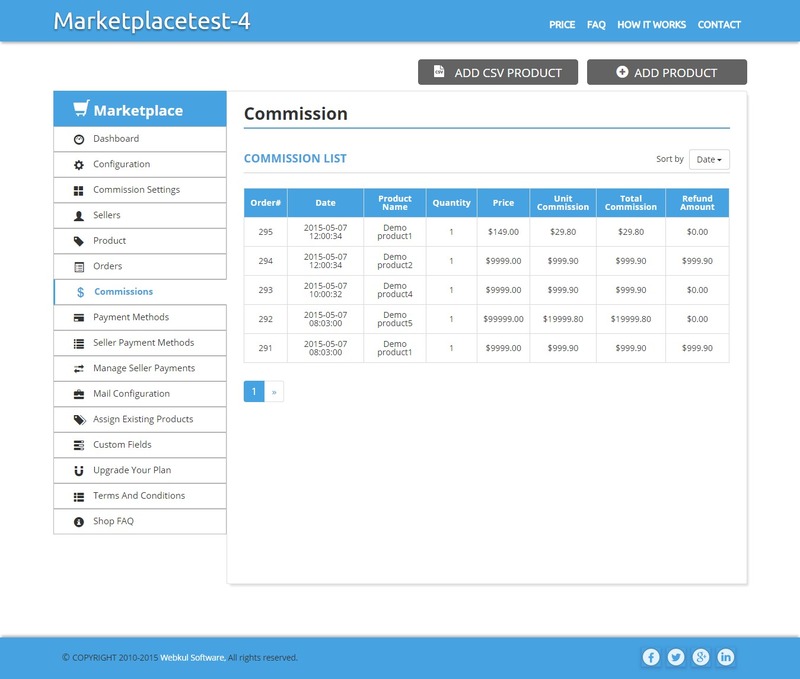 Product Wise Commission: It will enable whether to set product wise commission or not. 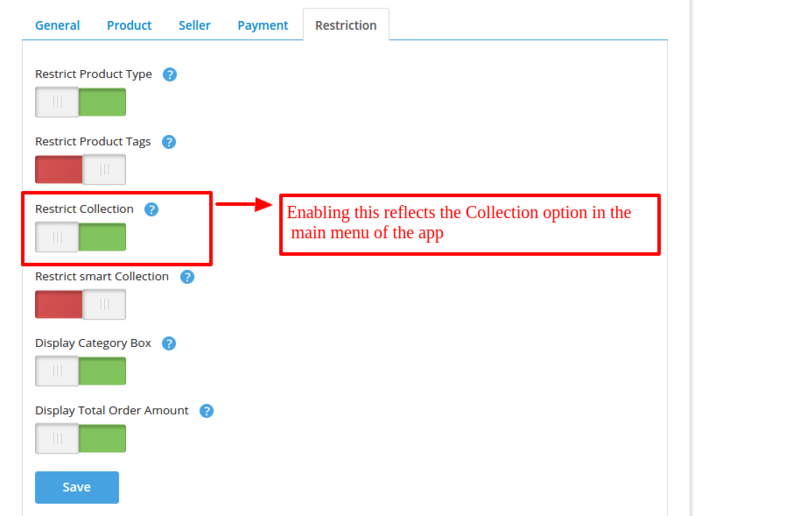 Allow Seller To Fulfill Item: From here admin can set whether to allow the seller to fulfill an order or not. Auto Approve Seller: Here admin can set the option for whether you want to approve seller automatically or not. 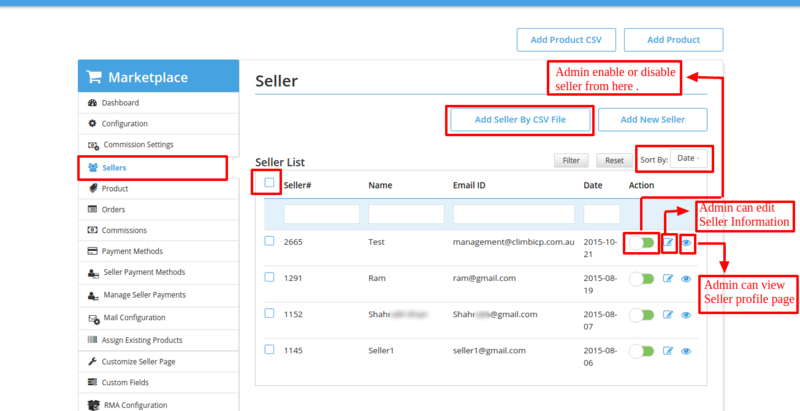 Seller Add By CSV: Here admin can enable whether to add seller through CSV or not. 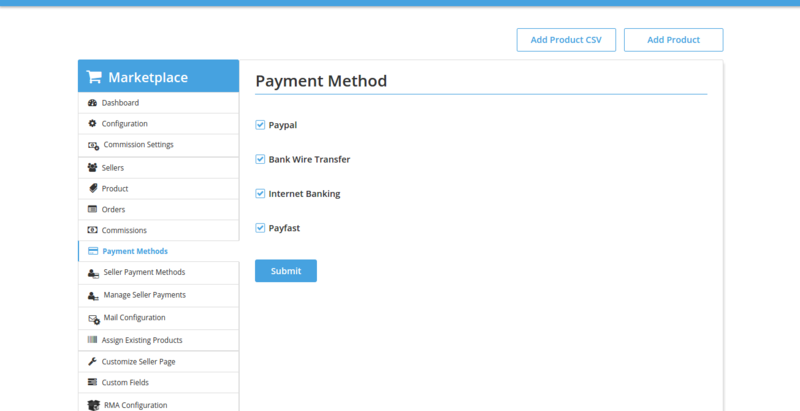 Paypal Sandbox: This will give an option to pay in Paypal using Sandbox (Test mode). 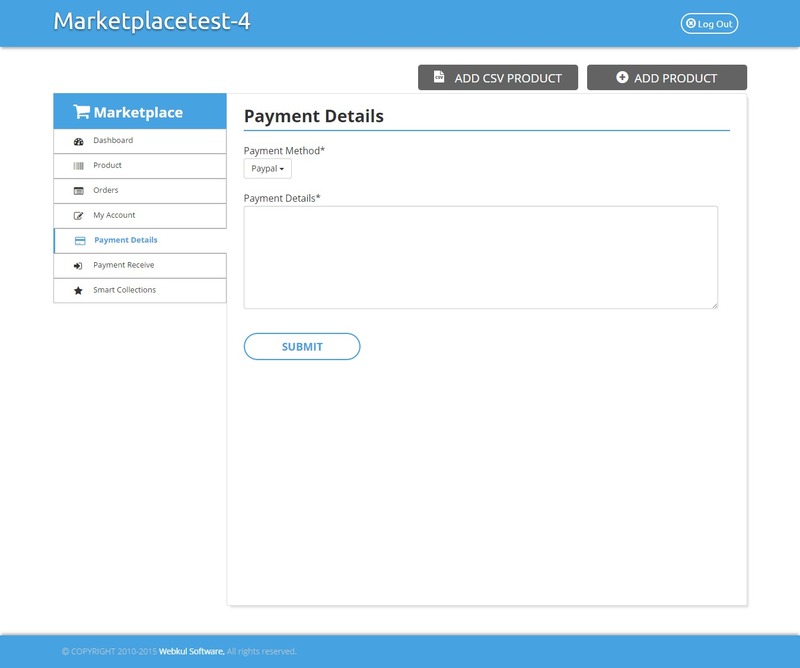 Payfast Sandbox: This will give an option to pay in Payfast using Sandbox (Test mode). Restrict Product Type: Admin can restrict product type for products in his shop. Restrict Product Tags: Admin can restrict product tags that are used as search keywords for the product. 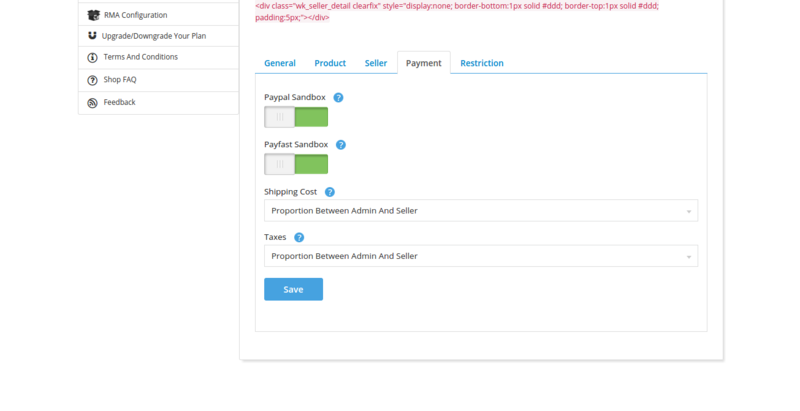 Restrict Product Collection: Admin can restrict product category/collection for products on his shop. 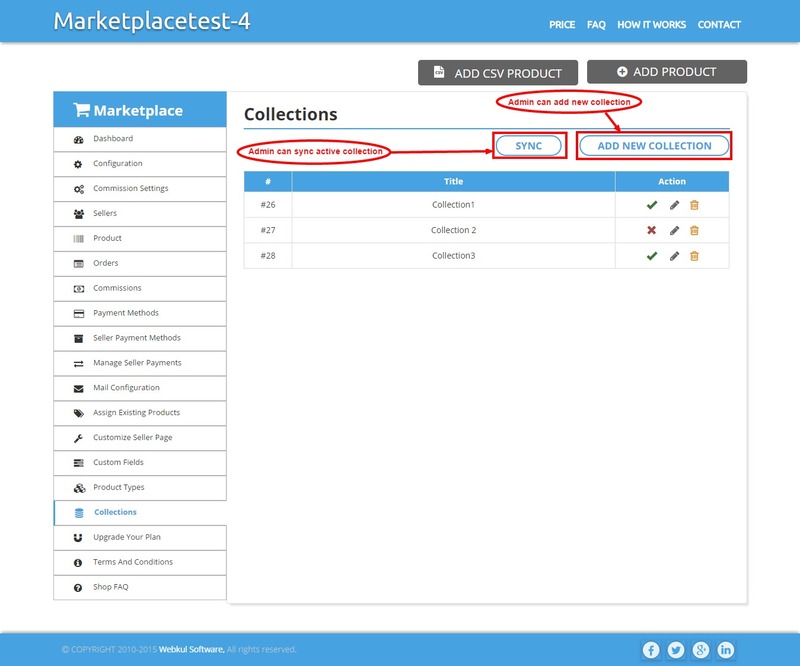 Restrict Category Box: This will give an option for choosing collections while adding a new product or editing an existing product. Restrict Total Order Amount: Admin can restrict whether to show the total earning of orders to the seller on their dashboard or not. Admin can add commission for seller & can also view previously added commissions for the seller. The commission can only be added for active sellers. From here, admin can add new seller either manually or just by uploading seller CSV file as per mentioned format. 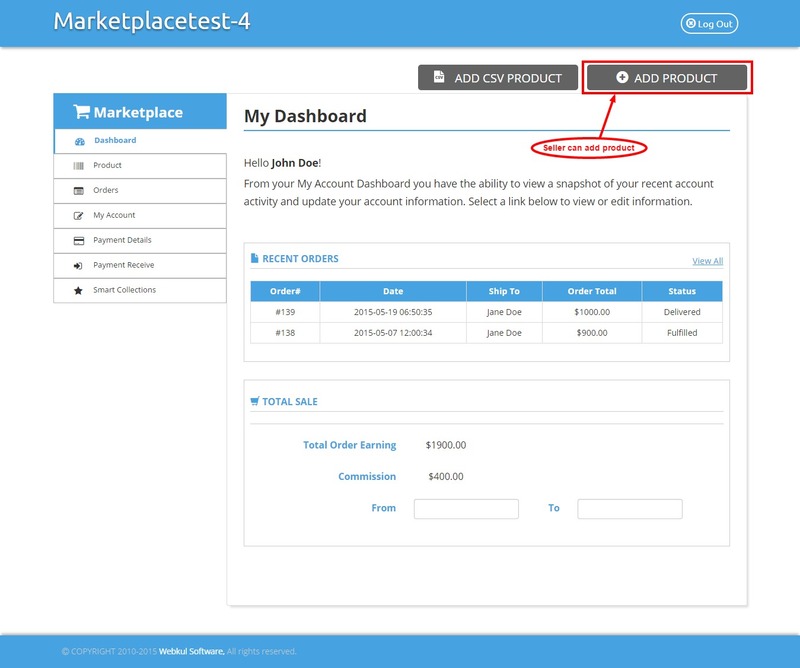 Admin can approve or disapprove seller & can also edit seller information. Admin can see a list of products from different sellers. 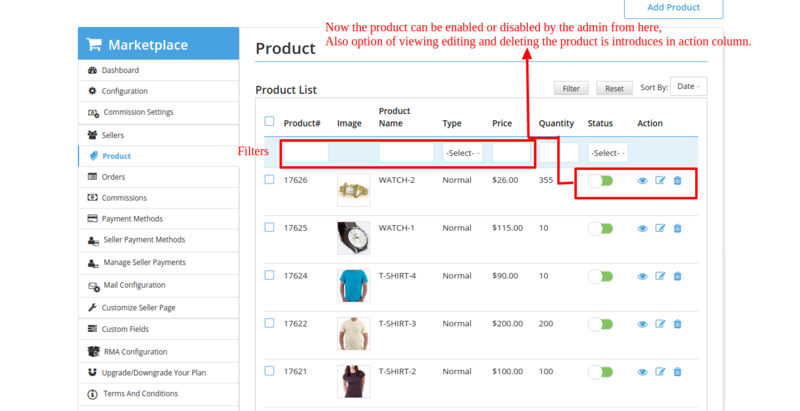 Admin can also approve/Disapprove product & able to view, edit or delete any of the products. Important Note : Also it is always advisable for admin to edit the product from our app only, as editing the product on app will automatically update the same on Shopify and store frontend, but only editing the product from Shopify end will not update that product on app and on seller panel of the app, hence this will create the discrepancies. Admin can view a list of orders. Admin can also search orders of any specific seller & able to view complete order details that also includes product & shipping details. 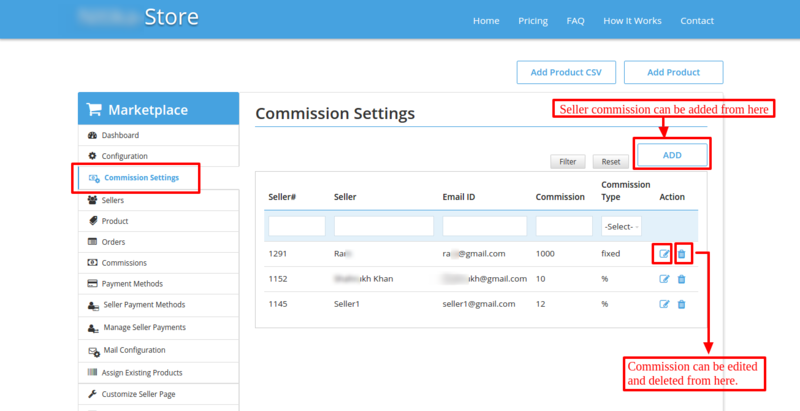 Here admin can know the commission details of the sold product. Admin can set payment method from here. The selected methods will be displayed on seller’s frontend & from there seller can add the payment details as per payment methods provided by admin. Admin can see payment details of each seller. From here admin can manage payment of individual seller. 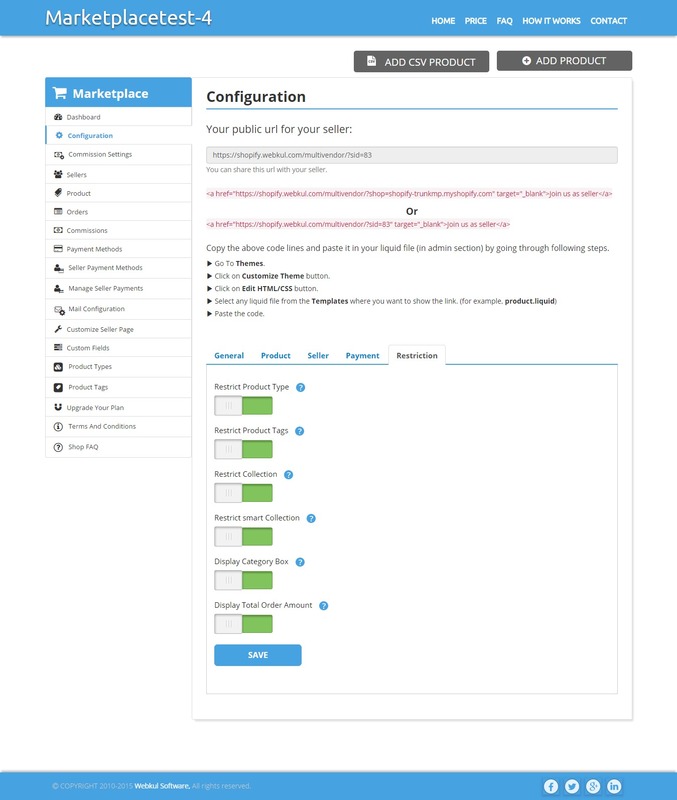 This option will be visible, only if the admin has enabled “Import Existing Product” from the configuration. It will allow admin to import all the existing products on shop & can assign any product to any of the sellers who are active in his shop. Admin just needs to select “Seller Email” & “Product Name” from drop down. After selecting a product simply click on the “Add This Product” button. 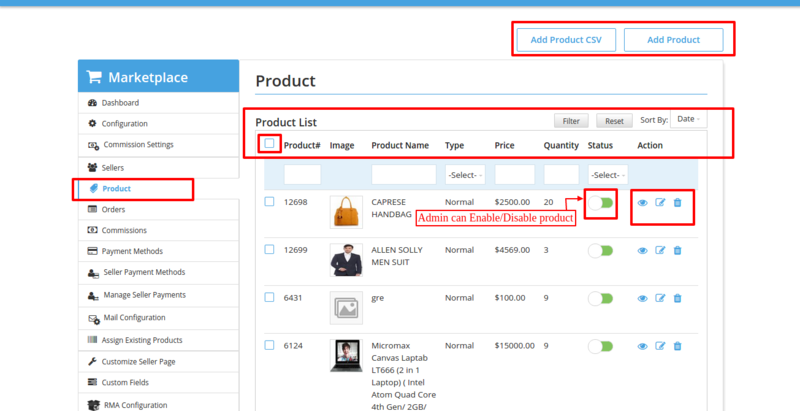 Admin can assign any number of products, just select the product from the drop down & keep adding. After selecting the products, click on the “save” button & all the selected products will be assigned to that particular seller. 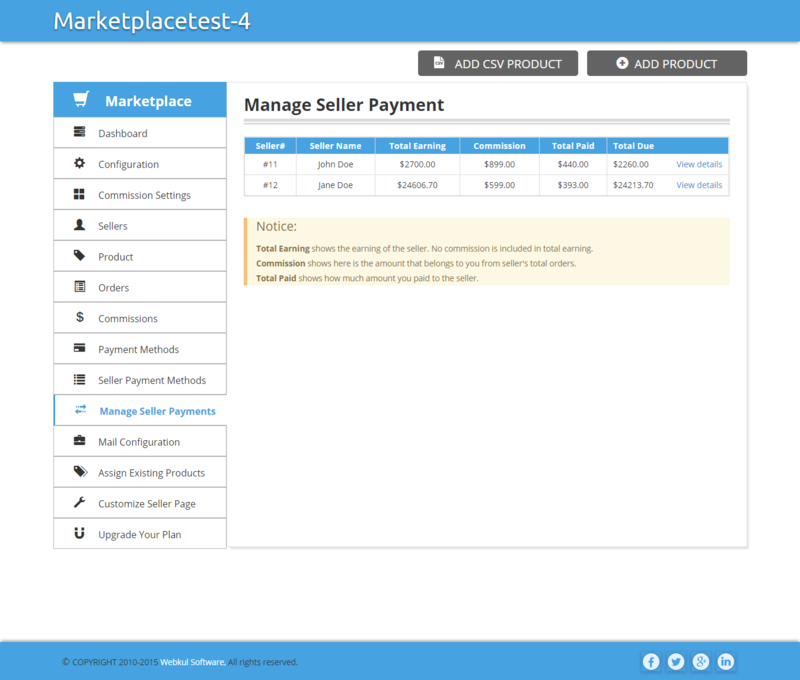 Our Multi-Vendor Marketplace comes with 3 different plans i.e. Bronze, Silver, Gold & each plan has different specifications & charges as well. If one has activated silver or above plan, then only he will able to view this option. 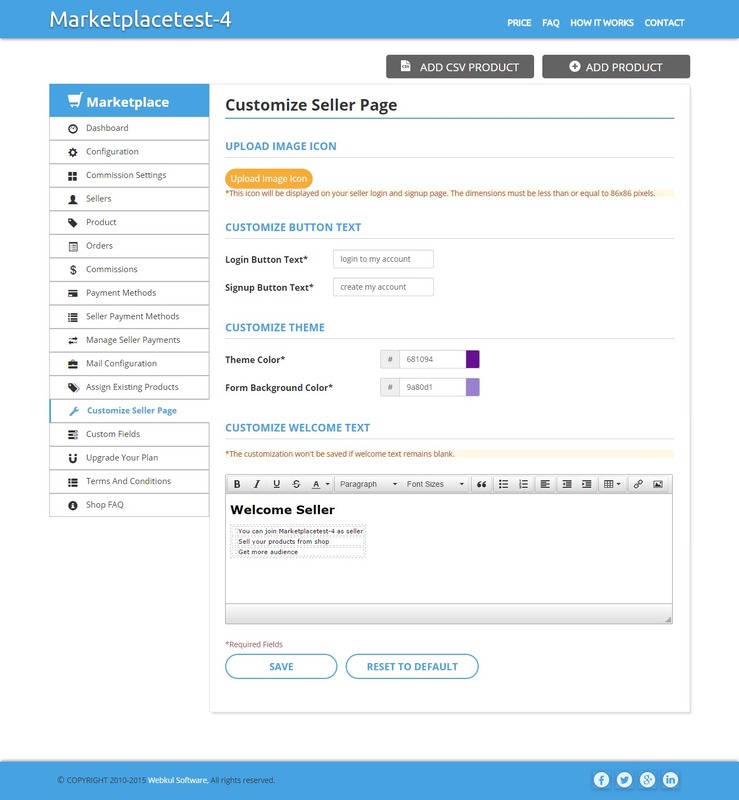 We have provided various options for seller page customization. But “CUSTOMIZE THEME” will only be visible to those who have activated Gold or above plan. UPLOAD IMAGE ICON: Admin can customize seller Signup & Login page by uploading an image as per mentioned dimension. 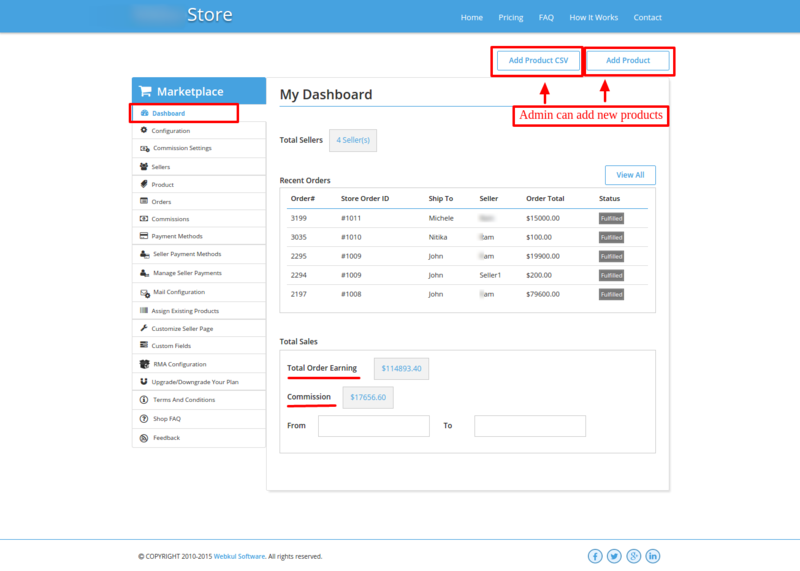 CUSTOMIZE BUTTON TEXT: This will add Customized text to seller “Login” & “signup” Button. CUSTOMIZE THEME: Simply add “Theme color” & “form background color” from their respective color picker & you are all set to view seller’s page with a new & colorful theme. 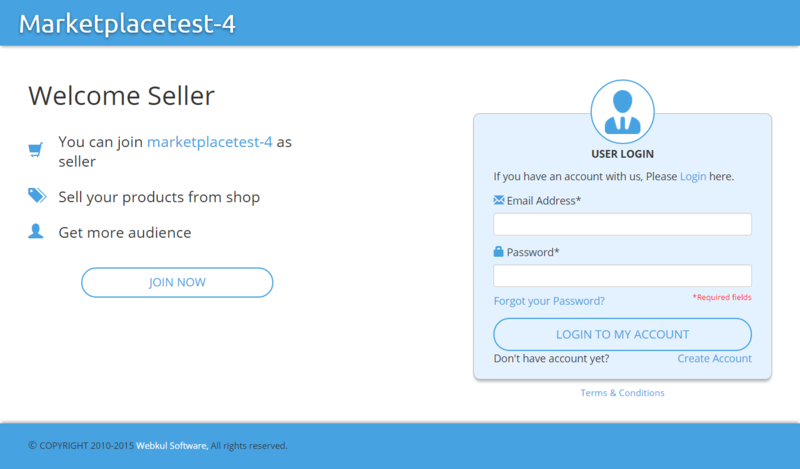 CUSTOMIZE WELCOME TEXT: Here admin can add welcome text that will be displayed on the seller login page. From here admin can add new fields in the signup form. 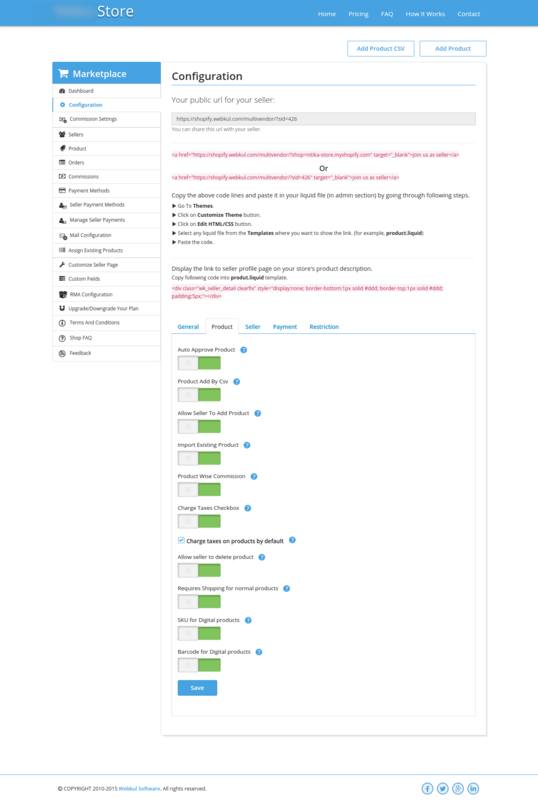 Admin can choose input type & can also set the order for any new custom field. From here admin can add product type for products on his shop. It will restrict the seller to choose only from the mentioned product type while adding any new product. 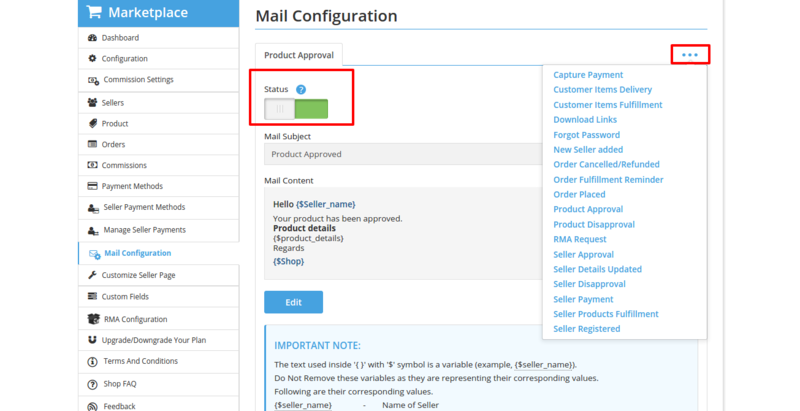 After adding product type, Admin can edit, delete & also enable or disable any product type. This option of Product Type gets enabled when the option of “Restrict Product Type” gets enabled from restrictions setting in the Configuration. Admin can add collections/category for products of his shop. This will also restrict the seller to choose only from the mentioned collection while adding any new product. After adding a collection, Admin can edit, delete & also enable or disable any collection. 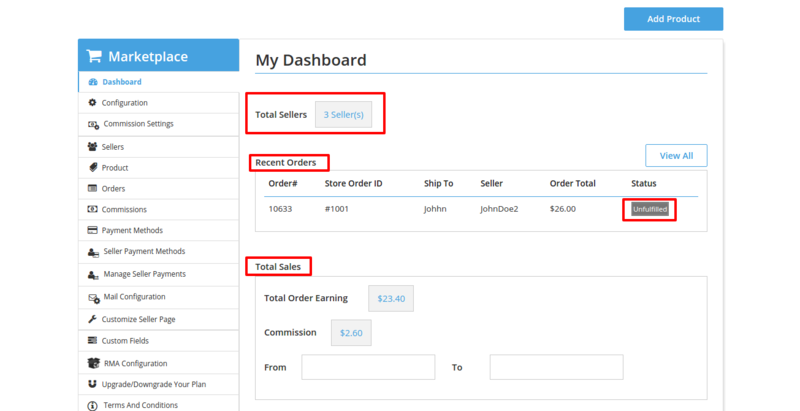 Admin can sync-collection with Shopify & can also import Shopify collection. This option of Collection gets enabled when the option of “Restrict Collection” gets enabled from restrictions setting in the Configuration. 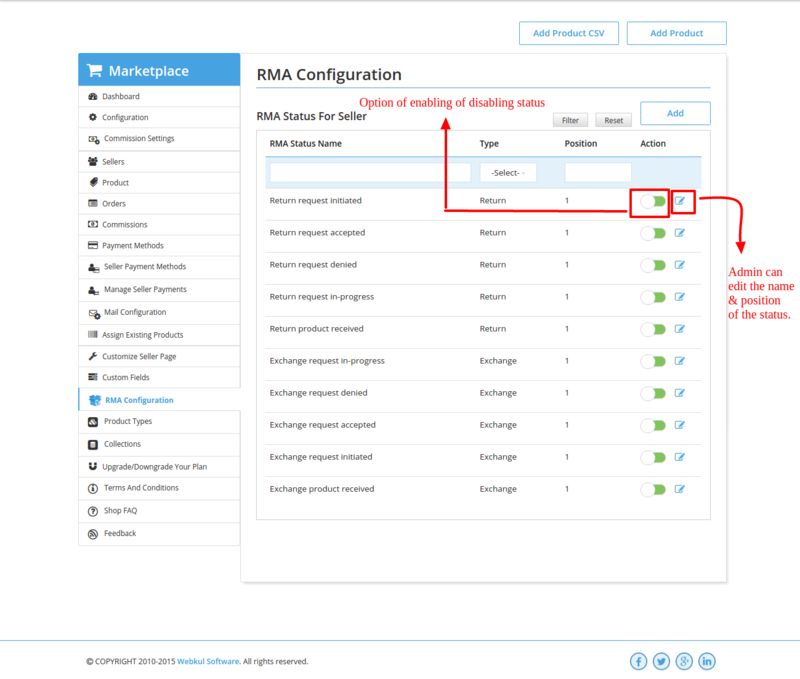 From here the Admin can configure the RMA settings (RMA stands for Return Merchandise Authorization). 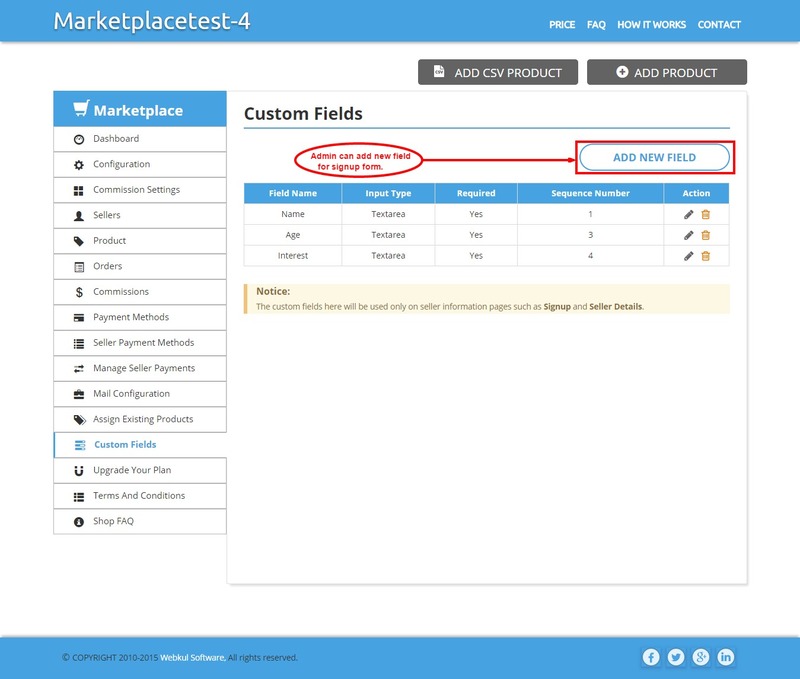 Admin can edit, enable or disable the option of RMA status for sellers. Here admin can upgrade plan as per need. We provide 3 different plans & each plan has its own specifications & benefits. 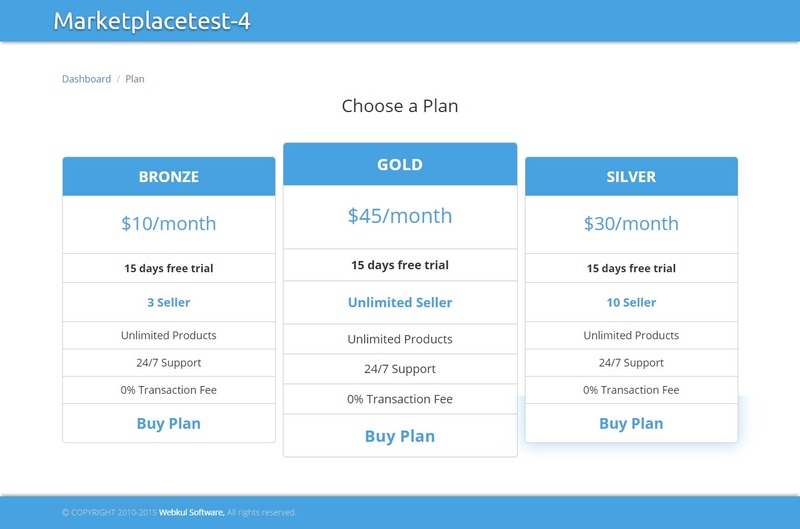 Bronze: This plan comes with a free trial for 15 days. Admin can add unlimited products but with a fixed seller limit. Only 3 sellers can be active with this plan & if admin wishes to add more sellers he needs to upgrade the plan. Silver: This plan comes with a free trial for 15 days. Admin can add unlimited products but with a fixed seller limit. Only 10 sellers can be active with this plan & if admin wishes to add more sellers he needs to upgrade the plan. Gold: This plan comes with a free trial for 15 days. Admin can add unlimited products & unlimited seller. 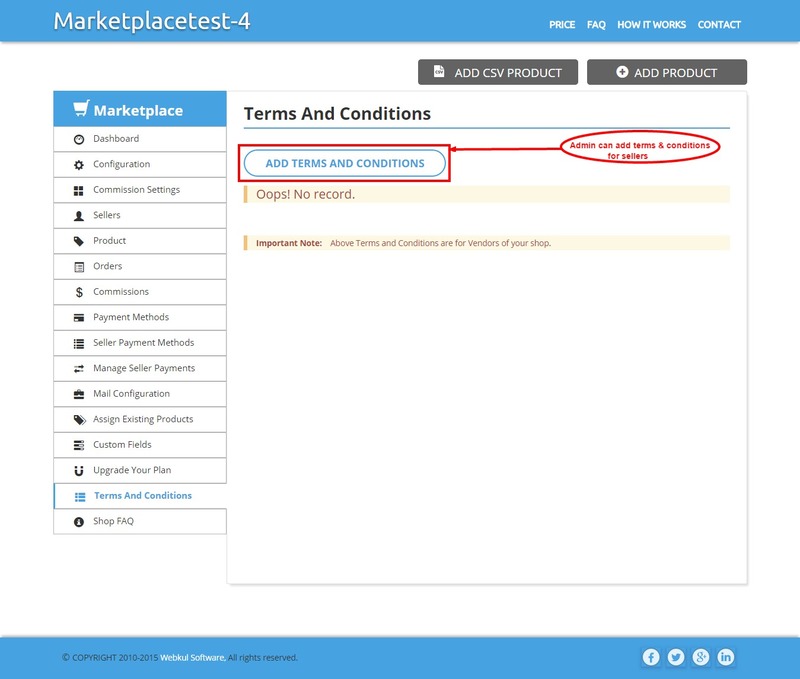 Admin can add “terms & conditions” for the seller of his shop. These terms & conditions will be on signup form & it will be mandatory for the seller to accept these “terms & conditions” for creating their account on your shop. Admin can add shop FAQ for his shop & these FAQs will also be visible to the seller. This would be seller login page (Refer the screenshot). The seller can signup through JOIN NOW or ‘Create Account’ link. After entering valid email id & password, the seller can log in into his account. It provides complete details of total orders & sale. The seller can know about the total sales between any two specific dates, just pick a date from date picker & seller will know about total order earnings & admin’s commission for that particular time. All the seller products are listed here. The seller can edit, view or delete the products & can know the status of the product, whether it is approved or not. Here seller can see order list of his products. Seller will be able to fulfill orders & can set a delivery date for any order. But seller can fulfill the order if the admin has permitted to do so. From here seller will be able to change his information like name & password & can also know the total number of products & orders. Seller needs to add payment details as per selected payment method & these payment methods are set by the admin. This will give details of the amount paid by admin to the seller. Seller will be able to know about the status of each transaction & can also search the transactions through their status. Hello. Can you help adding links to the product liquid files please? Hi Nitika, i have some issues with adding all the links to the product.liquid files. Can you help me with it? Hi Nitika. How payment process works between Buyer, Seller and Admin? Please provide me your Shop access at nitika.srivastava617@webkul.com, i will do it for you. Also you can raise a ticket for the same at webkul.uvdesk.com for further communication. I sent u a message via email! Hi, same problem than Douglas, can you help me Nitika? Adding code to product.liquid per your instructions does not add link to seller profile on the product description. Please advise. Please provide me your store access at nitika.srivastava617@webkul.com , and we will add the link to seller profile on the product description page. You can also write in for any further queries at the given email id or can also raise a ticket at http://webkul.uvdesk.com/ . Please ignore , if issue already resolved.